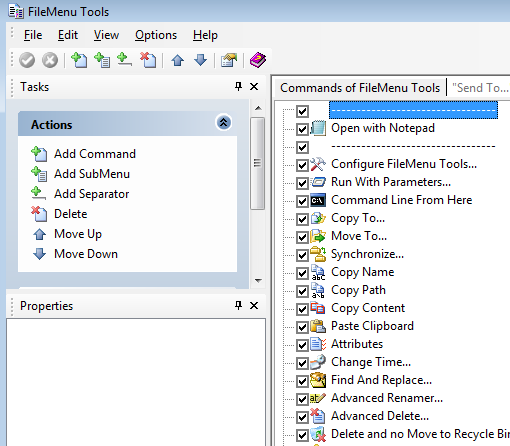 File Menu Tools is a freeware for customizing your windows explorer context menu (right-click) easily. Once installed you can configure what commands will be added to your context menu, adding or removing commands to context menu is a one click process, just select or deselect check boxes to add commands. It also shows the context menu links added by other applications, you can remove any of these if you don’t need to use them regularly. If you accept default commands the context menu will become longer and unmanageable, you can add file menu tools as sub menu to the context menu that way it is more usable. This can be changed from the Options menu, select “Show all the command in sub menu”. The interface of the app is simple to use, presents file menu tools commands, other program commands and send to menu in tabs, click on the tabs to manipulate the context menu. You can also add new commands easily, select Add command and fill in the options to perform different actions on files and folders, for example copy to specific folder. 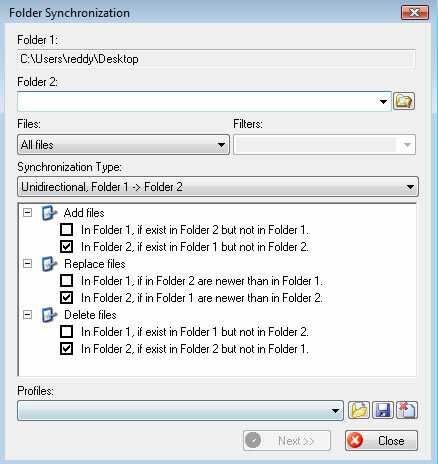 It also has file synchronizer utility that can be used to sync two folders, supports unidirectional, bidirectional or custom syncing rules. Overall this is a great freeware utility for customizing windows explorer context menu with all the commands you want. I have tested it on Windows Vista and works well.